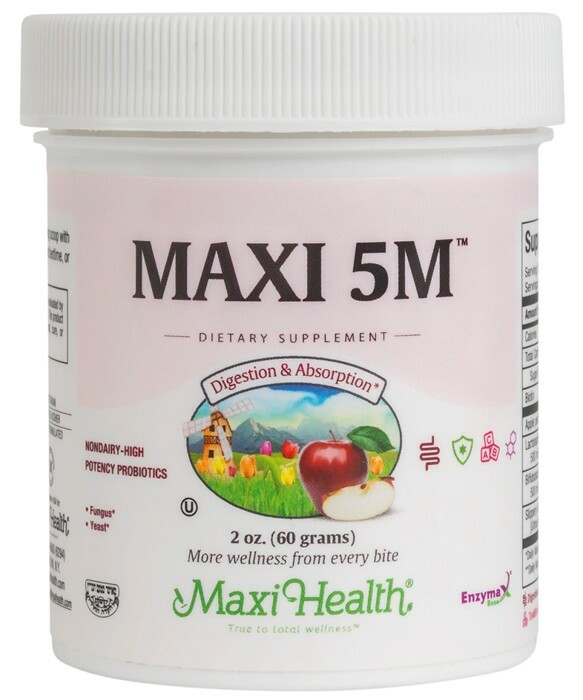 Maxi 5M™ is a probiotic powder. Probiotics are live organisms (which need to be abundant) in your intestines to support assimilation of nutrients and infection prevention. Maxi 5M™ has both of the most important probiotics that you need! Lactobacilius acidophilus (providing 500 million culture forming units) and Bifidobacterium Bifidum (500 million culture forming units) which can replenish and even enhance the correct quality and quantity of healthy bacteria lost. See the table below for how it is lost and what it means to have it restored. We added Slippery Elm Bark to support protection against stomach acid and other irritants to aid better digestion. Let the Maxi 5M™ work for you! This product contains no animal products, soy, wheat, salt, gluten, milk, artificial flavors, colorings or preservatives. • Enzymax®, a vital digestive enzyme complex, is a registered trademark of Maxi Health Research®, LLC. I do believe that maxi 5M is a must when taking antibiotics. My family members do not get stomach cramps or diarrhea when we take them together!